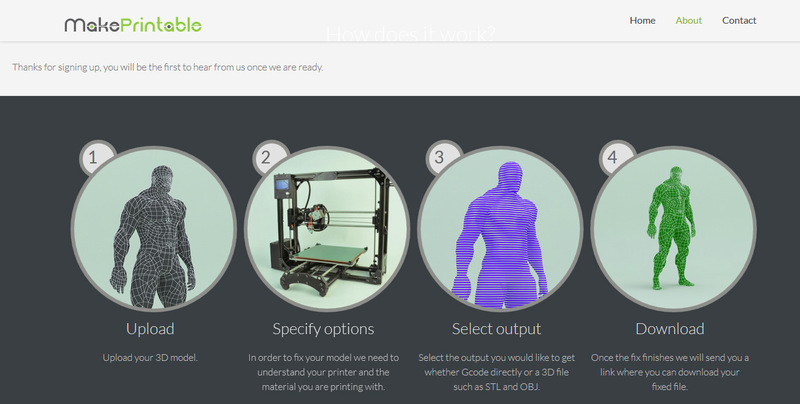 MakePrintable is a new web-based service that is supposed to offer users an easy to use option to have their 3D models error-free, so that they will be printing without issues. You need to upload your 3D model and the service will analyze and repair automatically many of the common problems that can result in issues when you try to print the model on your 3D printer. The service is supposed to take care of things like ensuring the model is watertight and solid, there are no issues with objects intersection in the model, no flipped faces or non-manifold issues, no more walls with 0 thickness a well as take care of hollowing a model to save material or having a smart filling of the model’s insides to ensure it is stronger. All this is supposed to happen through you web browser and as a result you can get the optimized and fixed model in Gcode directly or a 3D file such as STL and OBJ and then to print it on your 3D printer. It all sound very good, but the service is still not yet launched officially, you can currently sign up to be among the first beta testers. MakePrintable does sound promising and we are going to keep an eye on it when it enters beta status, so that we can test the service ourselves, meanwhile you can use other services that are free and already available such as the automated repair service from Trinckle or rely on a software that has some features for detecting and fixing automatically some of the more common errors that may prevent a 3D model to print properly.